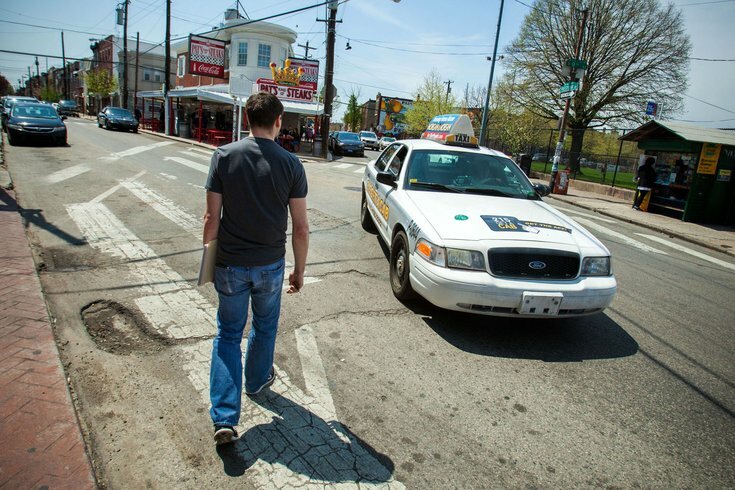 Outside of Pat's King of Steaks, reporter Michael Phillis heads for the taxi that will take him to the Adventure Aquarium in Camden. It was his most hair-raising ride of the day. Can't find a friend to drive you to the airport? Three years ago, you'd be stuck hailing a taxi. Now, you've got options. If you prefer an upscale ride, there's Uber's BLACK service, a luxury vehicle driven by a professional driver. You could go the traditional route and hail a taxi. Or, you could try UberX and Lyft, a pair of ride-sharing services that have revamped the city's transportation scene since arriving within the last six months. Unlike taxis, UberX and Lyft are operated by nonprofessional drivers using their own vehicles to transport passengers throughout the city. They don't have taxi medallions, the expensive licenses that allow cabs to operate in Philadelphia. And they aren't authorized by the Philadelphia Parking Authority, which has fined drivers and impounded vehicles. 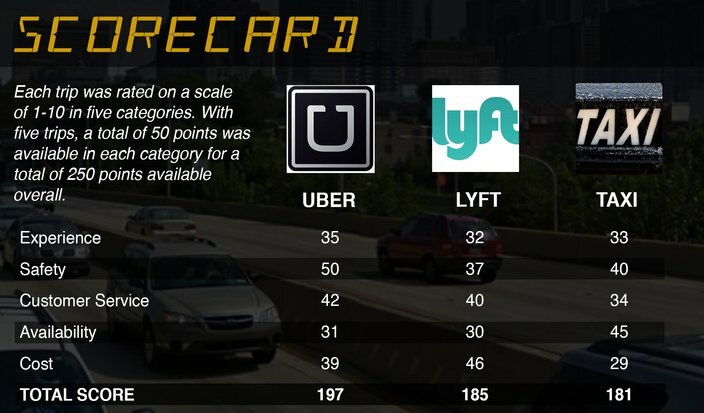 Yet, UberX and Lyft remain on the road. And their popularity is growing, thanks in part to their typically cheaper fares and ease of use. 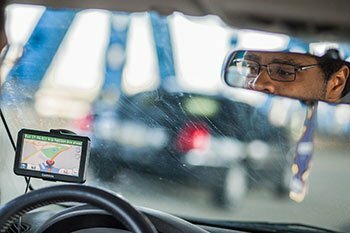 Passengers request rides via a smartphone app, which displays the driver's name, vehicle and estimated arrival time. The app also handles payment. 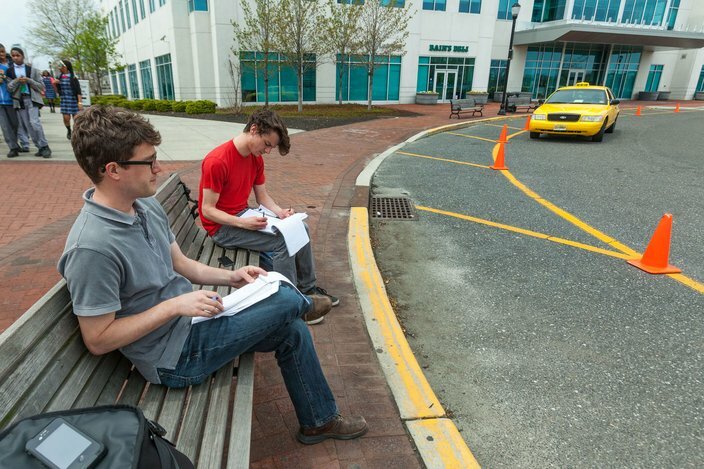 Now that the landscape has changed, PhillyVoice decided to test the various options. 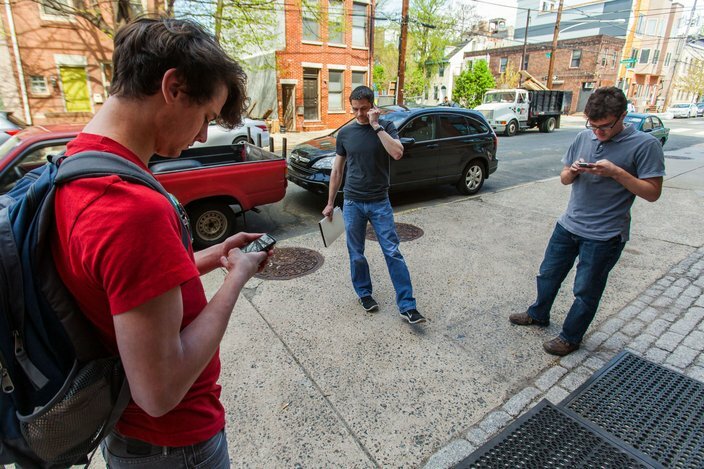 The challenge: Who can best get you around Philadelphia and South Jersey? Taxis, or their new, brazen cousins – UberX and Lyft? Last week, on a day that featured sunny skies and milder temperatures, PhillyVoice attempted to find the answer by sending three of our reporters – Michael Phillis, John Kopp and Daniel Craig – on a whirlwind tour of the region. 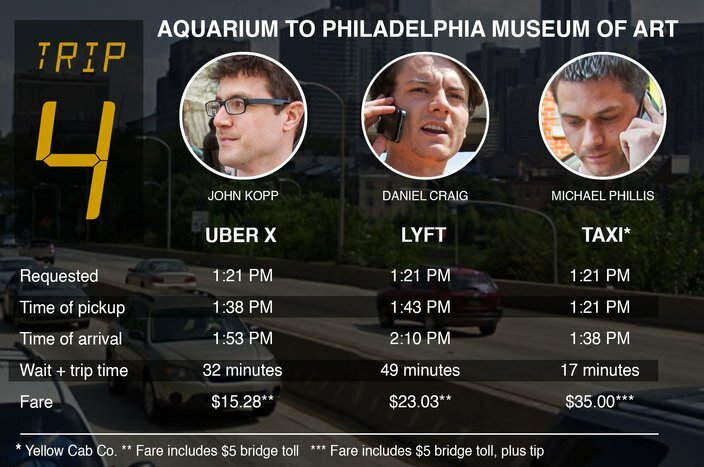 Armed only with cash, credit cards, smartphones and, in some cases, ride-sharing apps, the three took off from our Kensington newsroom to hit some of the area’s most common destinations: Philadelphia International Airport, South Philly for Pat's cheesesteaks, Camden’s Adventure Aquarium, the Philadelphia Art Museum and then back to Kensington. Kopp took UberX, Phillis hailed cabs, and Craig called for a Lyft. A black Toyota RAV4 rolls up outside Impact Hub, ready to transport me to Philadelphia International Airport. The vehicle is spacious, clean and comfortable. Actually, it’s the most enjoyable ride I’ll have all day. Traffic is minimal as we head down Fourth Street and enter I-95 via Market Street. The roughly 12-mile ride is pleasant, as is the driver, a Bucks County man who offers bottled water and freely tells tales of his five months as a part-time UberX partner. One rider vomited on his backseat but helped him clean it. Some students requested a ride to New York City. Ironically, one of his most profitable nights came during a snowstorm. The driver, who requests anonymity, acknowledges UberX has given taxicabs added competition, but he’s not sure it’s necessarily hurting every taxi driver. He knows one cabbie who has not taken a hit. But he figures the owners of taxi medallions, which have lost considerable value, are hurting. “I would be pissed off at Uber if I was one of those guys,” he says. We arrive in 18 minutes. If I actually had a flight to catch, I'd be quite pleased. Five minutes after calling for a ride, a cab pulls up. The sedan’s spartan black interior is clean, utilitarian. Two minutes later, with the driver already on the road, I receive a phone call from the cab company – my taxi is waiting for me. I had accidentally grabbed a cab that was circling the neighborhood instead of the one on its way to pick me up. This gets to a key point in favor of cabs – they saturate the city and are often easy to find. A ride usually arrives after only a short wait when they aren’t already parked or circling in front of major destinations like airports or museums. The driver is pleasant and quick to talk as soon as I brought up Uber, although he declines to provide his name. He says Uber's presence in Philadelphia has impacted his business, reducing it by about a third. At one point he says he considered whether he wanted to continue driving a cab at all. “I’m trying to jump to Uber,” he says. Uber can offer more flexible hours, but he qualifies that idea by saying that there is a lot to consider, including pay and long-term potential. He has yet to make a decision. Airport-bound, there is no crazy driving, sharp corners or near misses, making the ride more pleasant than some of the others I would experience later in the day. We arrive in about 20 minutes. Then it was time to pay, and the difference between the cab and the other services became clearer – the cab just costs more. The total fare came to $32 – about twice as much as the others. My Lyft experience started off smoothly. I was able to get a car within five minutes. Entering a clean 2011 Toyota Corolla, I was greeted by the smell of the two “ice bomb” air fresheners hanging from the car’s rearview mirror. “How long do you think the ride will be, and how much do you think it will cost?” I ask. He was almost right on the money. His route up Fourth Street to Market, then to I-95, was smooth and comfortable. Working for both Lyft and Uber, the driver refused to say which employer he preferred. What a wreck. Figuratively, that is. UberX does not pick up riders from the airport, so I’m left taking Uber’s luxury service, Uber BLACK. I pay a flat $55 to ride in a Chevrolet Suburban outfitted with leather interior. The professionally trained driver opens the door for me, but the positive experiences mostly end there. The driver is friendly — offering chewing gum, mints and bottled water — but his route selection is questionable. We inexplicably end up on the Schuylkill Expressway, where (of course) an accident forces traffic to a crawl. Eventually, we exit via the South Street Bridge and snake our way to Pat’s — 48 minutes after leaving the airport. I’m hungry. And very late. Daniel departs the airport 11 minutes after me but arrives 16 minutes before me. And he pays about $35 less. At least there is no line for a cheesesteak. The cab was waiting at the arrival gate. I hop in, tell him where I want to go – no address, just the name of the steak shop – and he gets moving. North on I-95 to Broad Street, then snaking our way over to Ninth and Passyunk. About a 9-mile trip. He is polite, answering questions, but doesn’t talk much, and the conversation quickly dies. He never has to ask again where I want to go or how to get there, and we arrive in good time. There is nothing unexpected, just an ordinary trip. Requesting a car on Lyft’s mobile app did not look promising. The closest car I could see on Lyft’s map, which displays the location of the nearest available driver, showed a vehicle about 20 minutes away in Darby. Luckily, that driver responded, and so I stood on the curb near the taxi stand for about 17 minutes while Mike and John were whisked away shortly after summoning their rides. The waiting was a common theme for much of the day. Lyft’s system allows you to pinpoint the exact spot on the road where you want to be picked up. This led to some confusion, as I accidentally set the GPS marker one street over, across the train tracks that separate the two streets. When Anthony, the driver (seen at left) arrived, he was very patient, racing over the bridge above the tracks and down to the street where I was waiting. Anthony made sure to ask if I was comfortable with the temperature and leg room, the latter of which he couldn’t really do much about considering the cramped, blue Ford Focus. He used to drive for Uber and said he preferred working for Lyft. Apparently, venturing into Camden isn’t the norm for UberX drivers. “You are the only one who has given me a crazy destination so far,” jokes my latest driver, a Temple University student in a nondescript Honda CR-V. Duly noted. The 4.3-mile jaunt over the Ben Franklin Bridge takes 23 minutes. I'm also charged a $5 fee for crossing the bridge, even though tolls are only paid when exiting New Jersey. (Presumably, my driver wants to return to Philly and may not have a passenger. Fair enough). The driver, who requested anonymity, says he easily earns $20 per hour. He drives whenever he has a free moment, clocking 30 to 40 hours each week. He knows the Philadelphia Parking Authority has been fining UberX drivers and impounding cars. But he’s not concerned, because UberX picks up those costs. Two trips with calm drivers seem to dispel the myth about cabbies as aggressive death-defying pilots. Check that. The third trip of the day, with PhillyVoice photographer Thom Carroll joining me for the ride, offers a reminder that there is often some truth behind many myths. First, the driver asks for directions to the aquarium on the Camden riverfront. Then, he accelerates sharply on his way north to the Ben Franklin Bridge, causing Carroll to reach for a seatbelt and strap in. Not outright dangerous, but it sure isn’t calm. On the bridge, his speedometer edges above 60 mph, and as he turns into Camden, the car’s momentum throws me a bit awkwardly into the personal space of my colleague. We arrive in one piece. My Lyft app tells me I'm getting a Lincoln Town Car. So when one pulls up with a waving driver, I hop in without question. We start chatting, when suddenly, I receive a phone call. “Your Lyft driver is here,” the person on the other side says. Confused, I ask the driver if he is with Lyft. Baffled, he asks if I'm Kevin. I am not Kevin, I say. He is not Lyft, but Uber. We enjoy a laugh as he drives me back to where my Lyft driver is waiting, both noting the strange coincidence of two similar cars being requested at the same time and place for two different ride-sharing services. My Lyft driver, Ghoneim, who was only comfortable giving his first name, is well aware of Lyft’s current outlaw status with the Philadelphia Parking Authority but was not afraid to list the negatives he perceived with traveling by taxi. I found his first two complaints slightly ironic, as there’s some trash in the backseat, and he spends most of the ride looking down at the phone in his lap to follow the GPS directions. But at least I have plenty of legroom. A taxi sits outside Adventure Aquarium, waiting for any rider to claim it. The temptation to hop inside grows with each passing minute. My UberX driver is at least 10 minutes away, traveling from Philadelphia. The driver mistakenly stops elsewhere in Camden before calling to find out exactly where I am. Ultimately, 17 minutes pass before my ride arrives, my longest wait of the day. The cab is still there when I depart in a Hyundai Sonata smelling faintly of stale cigarette smoke. It's a 5-mile straight shot, and I’m in front of the Art Museum steps within 15 minutes, ready to add my Rocky impersonation to those already on display. An older man (who I would later learn was named Cliff Stark) stands outside the aquarium near his cab smoking a cigarette as I approach. I feel guilty for interrupting his break and get in. The car is dingy and clearly an older model – the fabric on the backseat is visibly worn. He listens briefly to my destination before quickly calling for help about the proper fare. The old cab didn’t accept credit cards. We end up negotiating the final amount – $35 including tip – and I trust he is being honest. It would be my favorite ride of the day. Stark is based in Jersey and, at age 60, had started as a cab driver just last year. The previous 42 were spent as a truck driver. “I got tired of being away from home,” he says of the career switch. Now, “I get to talk to people instead of sitting in the truck.” And he has a gift for that, making pleasant conversation during the ride, knowing when to ask for help with directions without interrupting and seeming genuinely happy to engage. He tells stories of crazy guys significantly overpaying for rides – one guy, he says, tried to fork over many hundreds of dollars in cash for a ride to Wawa – and was lackluster about the threat of Uber, which has little presence in New Jersey. I arrive at the Art Museum after a peaceful drive and pay my fare - in cash. Sometimes, a good driver makes the difference. Driver requested. Driver en route. Then, about five minutes later, a text message. Same routine again: Request driver. Driver en route. Then, the text. Finally, on my third attempt, Igor’s car can be seen crossing the Ben Franklin Bridge to pick me up in Camden. Igor explains that some girl has spilled coffee in the back on his previous ride. A college student on his ninth day on the job, he asks me if I’ve got the toll going back over the bridge, which is odd considering the previous driver told me that the toll comes out of the driver’s pocket. “I can get it man, I got money,” he tells me. I offer to cover it, which doesn’t stop him from asking the toll booth worker if we even have to pay, since he only went to the aquarium and back. Unsuccessful in his attempt, I pay the $5 toll. Despite a wrong turn on Fairmount, Igor gets me to the museum in a direct and reasonable time. I can’t complain, since nobody else was willing to pick me up. My final ride provides the most experienced driver — a retired steelworker who previously drove limousines and taxis on the side. But he switched to Uber, which he claims is more profitable. Before we get out of Eakins Oval, the driver spots an SUV with a flat tire. He rolls down his window, hollering to alert the other driver as we stop at a red light. He also can't resist touting his own resume, quickly informing the SUV passengers that he previously chauffeured various boxers around town. The light flashes green and off we go. With that, I pop out of his Mitsubishi Lancer and into Impact Hub, our final destination, moments before the rain begins to pour — and a minute behind our taxi passenger. For the third time, I find that I’m easily able to get a car before my colleagues. I can see cabs circling in front of the Art Museum steps and flag one instantly for the 3.5-mile ride back to the office. The driver is on the phone as he pulls up, but he gets off soon after getting on our way and makes conversation. He explains his work schedule and said that along with driving a cab, he also is a vendor at area sporting events. We hit some traffic on Vine Street, but I arrive just as the rain starts falling. My credit card, which I used for three of the trips, won’t work, presumably because the fraud detection program watching my purchases is skeptical of my apparent joyride around the city. I fish out another form of payment and go back into the office as the rain picks up, happy I’m not Daniel, who has yet to return and presumably is still waiting on a Lyft. I figure with the Art Museum steps' popularity as a tourist spot, I should have no problem getting a car quickly. I am wrong. Another wait of more than 20 minutes becomes especially irritating when it begins to rain. My driver, Quang, is the first driver I've had today who does this full time. He explains to me that he drives for both Uber and Lyft at the same time, keeping both meters on simultaneously and responding to requests from both as they come in. His Honda Odyssey is well-kept but is worn down like a soccer mom’s minivan that has seen too many dirty cleats. “Uber has more customers than Lyft,” he says. My fare is a measly $8, but I arrive at the PhillyVoice office last. Lyft helped me travel frugally, but it tested my patience. UberX mostly proved to be cost-effective and reliable, charging cheap rates and arriving within several minutes of my requests. The comfort of the rides varied, as some vehicles were more clean, spacious or newer than others. My safety was never in doubt, as the drivers operated without aggression and obeyed all traffic laws. 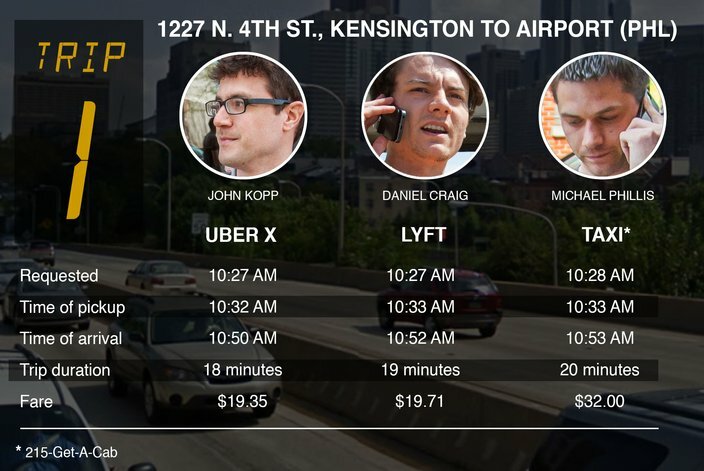 Beyond airport pickups, UberX appeared to be readily available throughout the city. Cabs are reliable, accessible just about everywhere, and the drivers usually know the city well enough not to get lost. At the same time, taxis tend to have a utilitarian, impersonal feel, and they can get expensive. One of the drivers on our trips drove aggressively. Lyft drivers are generally friendly and accommodating and go out of their way to try to make the passenger comfortable. But there’s no consistent experience due to the variety of cars allowed to participate. Also, some cars are significantly more enjoyable rides than others in terms of cleanliness and space. The rides are much cheaper than taxis and usually slightly cheaper than Uber. Ultimately though, the lack of availability for Lyft is the Achilles' heel for the service. It’s a financially sound alternative to taxis, but only if you can actually get a car.